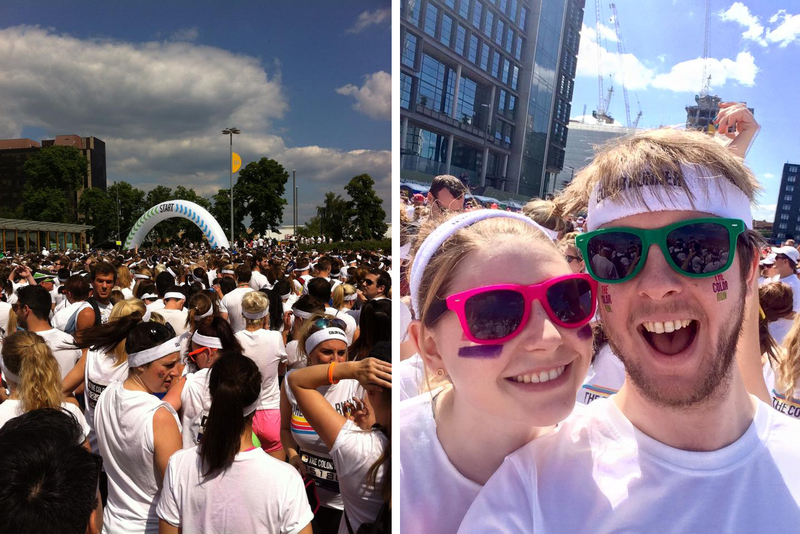 If you were in north west London last Sunday you might have come across crowds of people on the streets or on the Jubilee Line covered in bright colours looking quite sweaty and very proud of themselves (shout out to Immi and Anna who braved the 29C heat to be one of them) it’s the London Color Run! 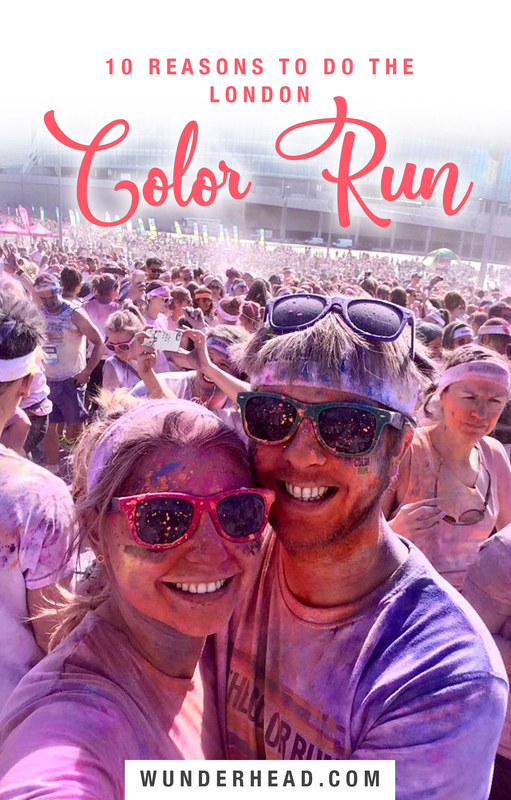 The original, largest and most unique 5k colour fun run in the world which celebrates healthiness, happiness, friendship and having the time of your life! Me and Matt running in 2015. 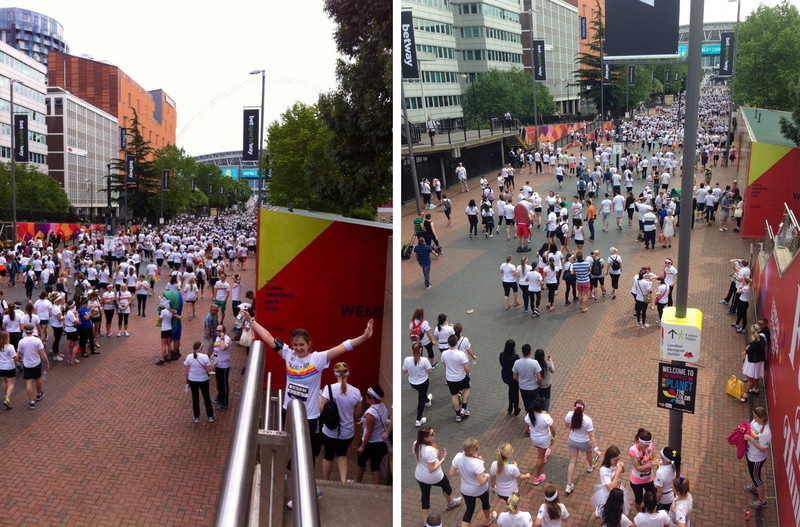 The Color Run is an American event that happens all around the world, including around Wembley stadium in North London. You can buy tickets from their website to all their events, registering as a solo runner or in a team. I’ve run it twice, once with friends and once with Matt, and it’s a great day out! 1. You get to dress up in all your swag. Who doesn’t love free stuff? Your race pack comes with a t-shirt, sweat band, temporary tattoos and your race number. You can also pay to add extras like hoodies and rainbow tutus. Tikki, me and Nici running in 2014. 2. Wembley is really cool. The walk from the train station to the stadium, surrounded by other excited people dressed like you, makes you even more hyped than you were before. Hordes of color runners streaming down Olympic Way. 3. The build up is super exciting. The holding area just before the start line is like a mini party, with mass stretches and warm up dancing. You never know how long you’ll be waiting so it’s a good idea to bring a water bottle. Left: The start line. Right: Warm up selfie! 4. The staff are also having a great time. 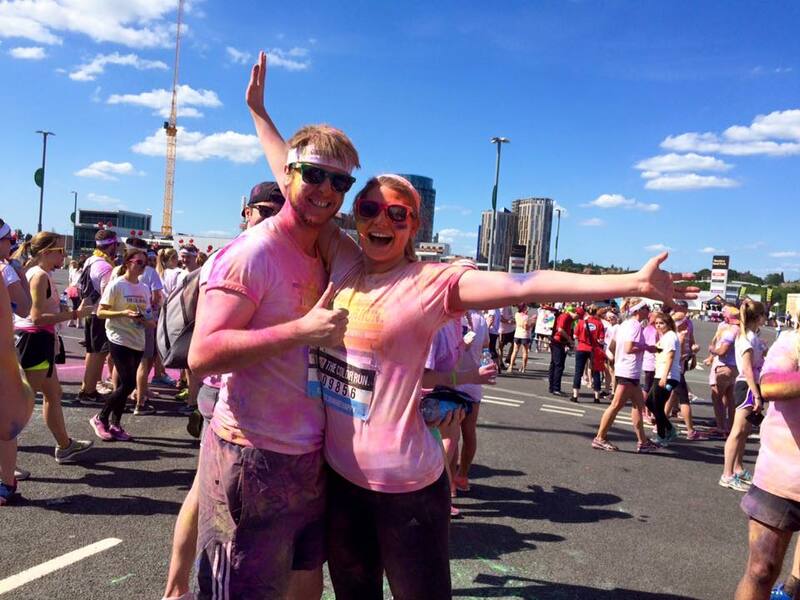 Each kilometre of the race is marked with a colour station, and you come out the other side covered in that colour. Whether it’s orange, pink, yellow, green or blue, the staff at each station are cheering you on as they cover you in bright powder. Left: After the orange station. Right: After the yellow station. 5. You feel great after running 5k. Granted, Wembley isn’t the nicest area to run around, it’s basically an industrial park, but cover it in rainbow colours and pack it with excited people and you’ve got enough vibes to carry you round a 5k track no problem. 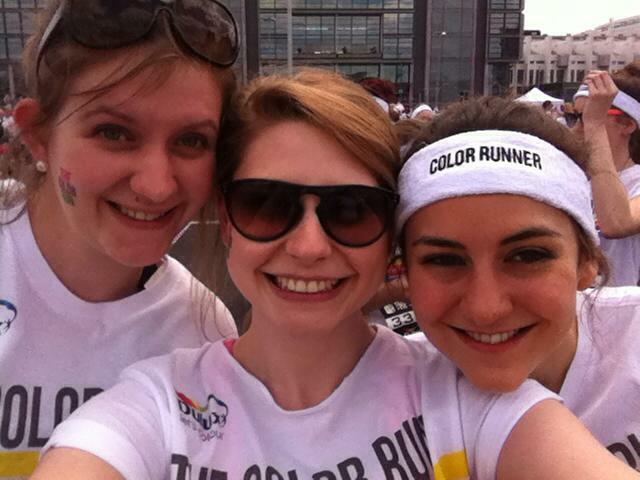 And the end you’re not just covered in colour but full of endorphins too! After the finish line, before the festival. 6. You get even more swag at the end of the race. 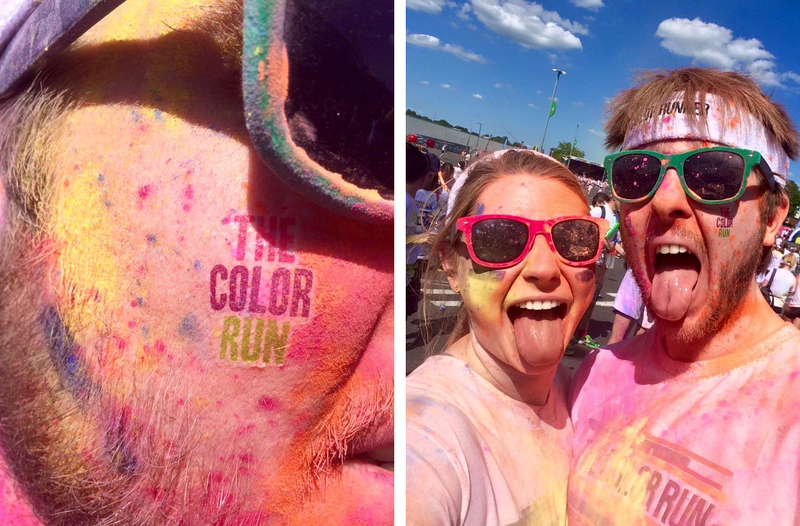 The finish line is packed with brands giving away free stuff, as well as photo booths to get your picture taken looking happy and colourful. Left: The New Balance brand area. 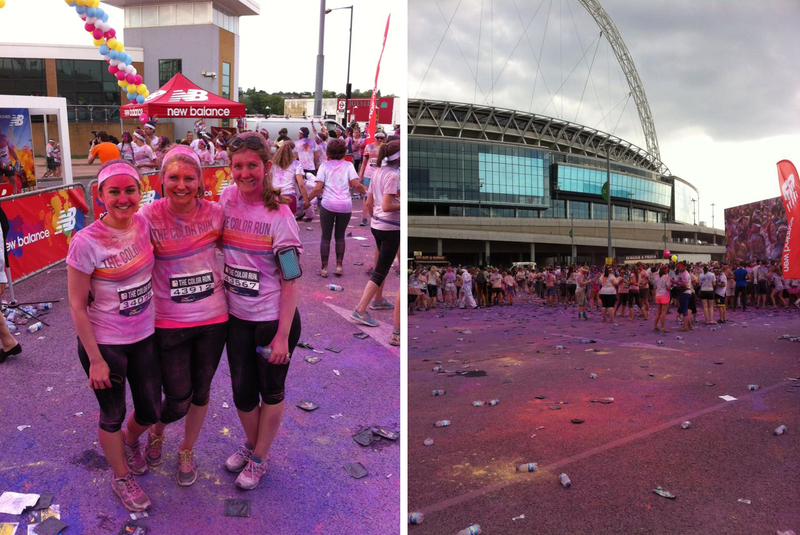 Right: The ground around Wembley covered in colour. Lots of the brands will put their photos on facebook, where you can find yourself and tag everyone for the chance to win even more prizes! 7. Everyone around you is also covered in colour. 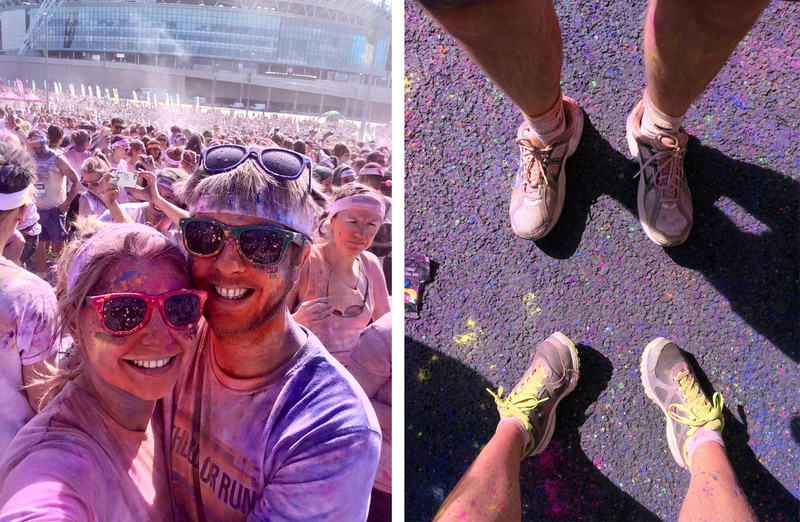 It’s quite a sight seeing thousands of strangers covered in pink, blue, purple, orange and yellow cornstarch. 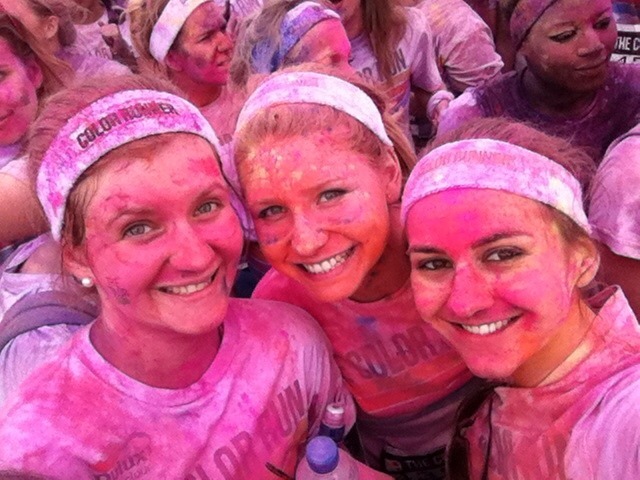 Covered in pink at the Finish Festival. 8. You get to throw colour at each other. 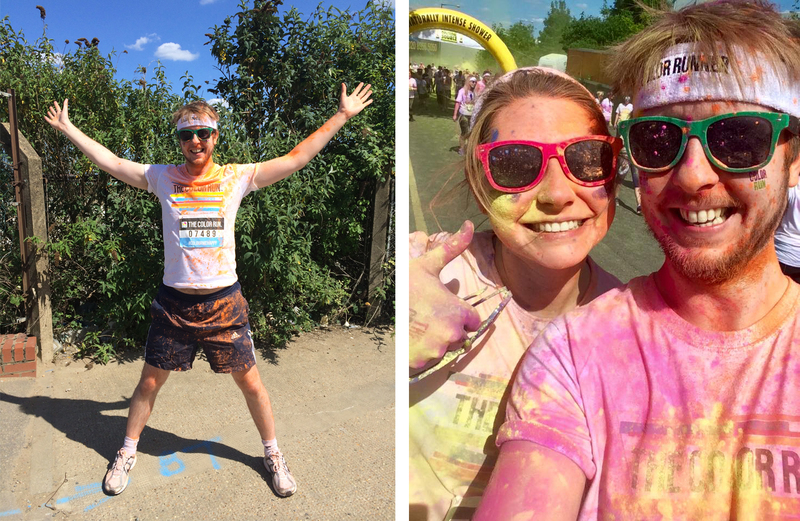 When you cross the finish line you get given handfuls of coloured powder packets, which you can rip open and do whatever you want with. Every 15 minutes they also do a timed colour throw where everyone throws colour in the air at the same time. Having a great time at the Finish Festival. 9. After the race there’s an after party. Those colour throws I mention happen in a huge crowd of people, all dancing away to live DJs. It’s like a really sweaty colourful festival. Crowds of people throwing colour in the air. 10. You get to go home looking like this. 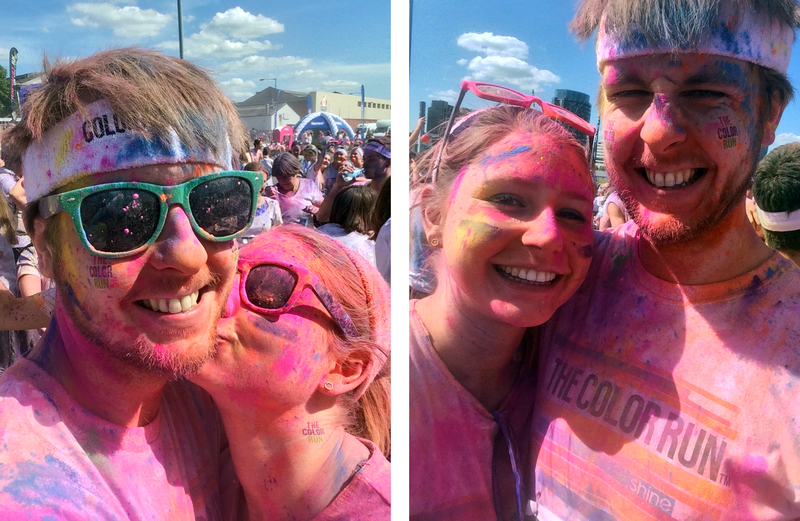 I’ve done the Color Run twice and both times I was asked by multiple strangers why I was so colourful as I made my way home. Normally I hate talking on the tube but I was in such a good mood I made an exception. 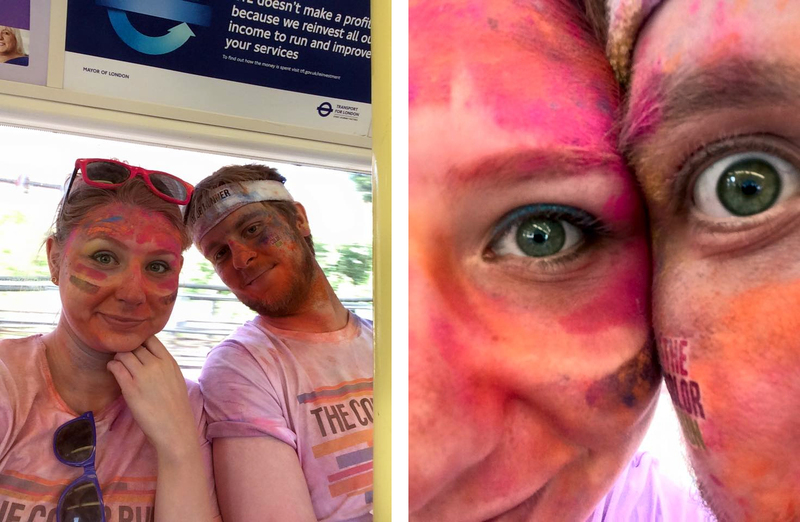 Trying not to leave colour prints of ourselves on the tube. They actually give you plastic ponchos so you can get home without making too much mess. 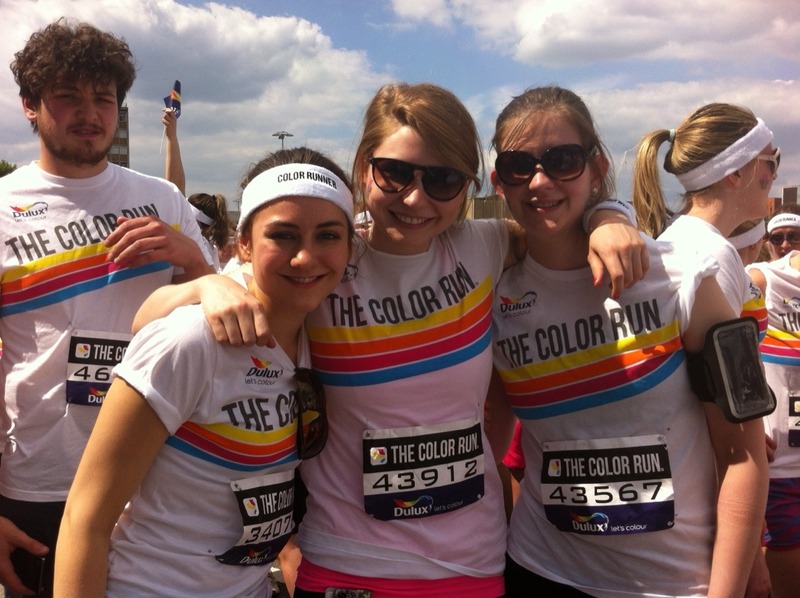 Have you done a Color Run? What was your favourite part? Did I miss anything? Does the American spelling of “color” annoy you as much as me?